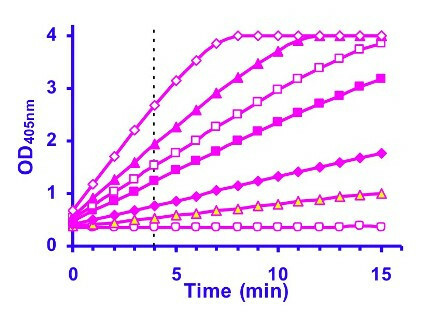 For quantitative determination of alkaline phosphatase (ALP) activity using stable p-nitrophenol phosphate substrate. Alkaline phosphatase (ALP) catalyzes the hydrolysis of phosphate esters in an alkaline environment, resulting in the formation of an organic radical and inorganic phosphate. In mammals, this enzyme is found mainly in the liver and bones. Marked increase in serum ALP levels, a disease known as hyperalkalinephosphatasemia, has been associated with malignant biliary obstruction, primary biliary cirrhosis, primary sclerosing cholangitis, hepatic lymphoma and sarcoidosis. Simple, direct and automation-ready procedures for measuring ALP activity in serum are becoming popular in Research and Drug Discovery. BioAssay Systems’ QuantiChrom™ Alkaline Phosphatase Assay Kit is designed to measure ALP activity directly in biological samples without pretreatment. The improved method utilizes p-nitrophenyl phosphate that is hydrolyzed by ALP into a yellow colored product (maximal absorbance at 405nm). The rate of the reaction is directly proportional to the enzyme activity. Applications For quantitative determination of alkaline phosphatase (ALP) activity using stable p-nitrophenol phosphate substrate. References Assay: ALP in Mouse Serum (Pubmed).